Winslow United remain third in the Spartan South Midlands League, Division 1 after a Rayners Lane equaliser ten minutes from time saw the spoils shared. In their first game back at Elmfields Gate in a calendar month, it the home side who took the lead seven minutes before the break. Harry Dalton forced in Simon King’s corner to net his 23rd goal of the season. United could not increase their advantage and it was the visitors who equalised with just ten minutes remaining. In the 92nd minute Aaron King hit the bar from close range which summed up one of those games for Paul Alleyne’s side. Elmfields gate hosts it’s first Spartan South Midlands League, Division 1 game in exactly a calendar month as Winslow United play host to Rayners Lane on Saturday afternoon. United have been on the road for their previous six outings in a combination of league and cup fixtures. The visit of Rayners Lane starts the run-in for their league campaign with seven of their remaining ten matches at Elmfields gate, eight if you include their Buckingham Charity Senior Charity Cup, semi-final, second leg tie. Winslow United remain in third position after a 3-0 Spartan South Midlands League, Division 1 victory at Amersham Town on Saturday. United went in ahead after scoring a couple of minutes before the break. Grant Karwacinski’s cross was laid back by Aaron King to his brother Simon, who drilled the ball home from 25 yards out. On 65 minutes, Aaron King’s cross was turned in at the far post by Alex Kedzierski for United’s second. Harry Dalton notched his 22nd goal of the season when he latched on to Aaron King’s flick-on before lobbing the home side’s goalkeeper. Buckingham Athletic find themselves 2-1 up against Winslow United in the first leg of the Buckingham Senior Charity Cup, semi-final. As always it was a game that never fails to disappoint with plenty happening throughout. Winslow had the first chances in the opening exchanges, both coming from corners. First, usual corner taker Simon King whipped in a ball towards Harry Dalton which was superbly saved by Josh McAdoo. The second chance came from the resulting corner, but this time Aaron King found himself free in the six yard box but could not get over the ball as it sailed past the bar. In the first ten minutes Winslow certainly started the better team and another chance was created by Simon King, who worked some space for himself and fired at goal but smacked the post and the ball went out for a goal kick. Totally against the run of play and Athletic found themselves 1-0 up through the head of Jack Menday, who rose highest above anyone, and powered past Sam Ashmead’s left. Winslow should have felt aggrieved with letting that goal in after all their pressure was undone. Ath now, were getting a foothold in the game as Neil King struck a free kick but was comfortably saved by Ashmead to his right. However Winslow were a constant threat form corners, this time Marcus Hussey could only head wide from a delightful Simon King corner. 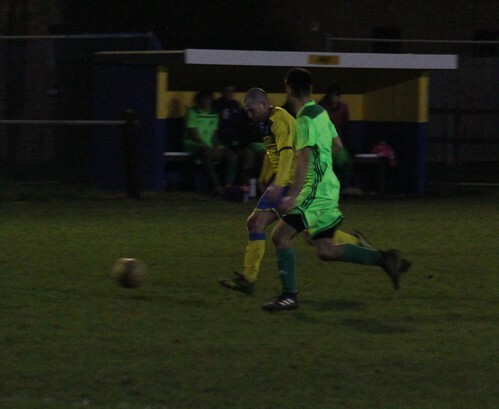 With the yellow and blues not taking their chances, at the other end the Athletic capitalised and made it 2-0 through star-striker Robbie Carter. He broke free and saw himself bearing down on goal but three recovering Winslow defenders stopped his path to scoring, so he cleverly cut back and passed off to Nick Bines, who had his shot cleared off the line, furthermore the ball cannoned back to Bines who squared to Carter, who had a simple tap in from a couple yards out. 2-0 to the dark and light blues. But Winslow were not fazed by going another goal down as they reacted brilliantly. Daniel Parsons, who looked dangerous from kick off, drifted past two Buckingham defenders and pulled back to Aaron King, who had his shot deflected over the bar. Winslow strived to half the deficit as a short free kick was played into Aaron King, who did well to control, turn and shoot which was saved by McAdoo, into the path of Ryan Freshwater who was deemed to be offside. The Ploughman’s end to the second half was ruined by a red card after the half time whistle given to Anthony Ball for descent towards the referee. At half time the score stood 2-0 to Athletic but they knew the game was not over yet. The first minutes of the second half seemed to had lost a slight bit of tempo from both teams as they struggled to create any real clear cut chances. Then all of a sudden a moment of genius from Sam Olewale saw him beat his man and dink the cross towards the head of Carter, but there was not enough pace to trouble Ashmead in goal. This sprung the second half into some life. United’s first chance of the second half came from a diagonal ball switched to Aaron King, who took his shot early, but some more fine glovework by McAdoo prevented the prolific striker from scoring. But Aaron King was to have his way with the help from his brother Simon. He delivered a cracking ball in that caused havoc among the Athletic defence, but Aaron King got hold of the ball, turned and finished wonderfully into the top right corner. Winslow kept battling a credit to them they were deserved for their perseverance. Now United were having the better of the chances and this time coming from Parsons, who picked up the ball at the edge of the area and rifled just wide of the mark. A momentum shift in favour of the yellow and blues. Parsons once again was causing trouble to the Athletic backline however this time Menday paid the ultimate price as he challenged Parsons, which was seen as a second bookable offence to the referee. Soon after a long ball from Ashmead was misjudged by Dan Staley, lead to Aaron King pouncing on the loose ball, and he looked almost certain to score if it was not for the heroic recovering challenge by the Athletic defender. That definitely made up for his mistake just moments prior. The game was nearing an end with Athletic doing their best to see it out and unfortunately the ploughman were dealt a huge setback as Bowers was seen a straight red for his double-footed lunge towards Kevin Owusu. The last action of the game came from a Simon King free kick that was superbly turned behind by McAdoo. Full time and Griffiths’ men had won the game 2-1 against their local rivals, Winslow United. Alleyne will take this narrow defeat going into the next leg as the first half belonged to Athletic and the second to Winslow. This close game makes the second leg all the more to look forward to and it is a fixture you do not want to miss out on. Daniel Parsons last-gasp equaliser secured a point for Winslow United and a hat-trick for the striker in an eight-goal thriller at FC Broxbourne today. The home side took the lead through a Clark penalty before Parsons drew the visitors level with a superb strike from the edge of the area. The United striker then put his side ahead before Broxbourne were level again from a free kick. On 35 minutes O’Brien put the home side back in front with a shot from inside the area. Within three minutes goal number six of the game arrived as Parsons slid the ball through to Desmond, who fired past Nugent, to make it 3-3. Bowers cross evaded Desmond at the far post as the teams went in level in an eventful opening half at Goffs Oak. A short corner resulted in Clark completing his hat-trick for the hosts as they regained the lead. United were pressing without threatening in the later stages with Aaron King’s cross-shot rolling across goal with nobody in the centre available to put it in. In the 90th minute Parsons was on-hand to grab a late equaliser and complete his treble as the spoils were shared in an entertaining game. High-flying Winslow United were dealt a setback in their promotion bid as they suffered a surprising 2-1 loss to a dogged and determined Wodson Park. The opening ten minutes was mediocre with Winslow looking slightly off their usual pace but it had to be said Wodson looked well up for the fight. The first real chance of the game came Winslow’s way through a delightful move that saw Aaron King play Sean Coles in behind with Coles whipping a peach of a ball in to the centre of the box as Luke Desmond manage to get on the end of it but could only find the gloves of Joe Wells. Winslow were now really getting a foothold in the game and pressing the Wodson backline. The pressure nearly told with a fantastic sweeping move by the yellow and blues ending with Simon King hitting the upright and the ball rebounding to him again but he could shot narrowly wide. More Winslow chances came as Alex Kedzierski freed Desmond, who found Aaron King in the middle who controlled and shot but was equaled by a cracking tip over the bar by Wells. However all the Winslow pressure was undone as light and dark blues found themselves 1-0 up, a goal that was totally against the run of play. An intended cross from Antonio Fusco was parried onto the bar by Sam Ashmead, but the ball fell straight to the feet of Jordan Halls who tapped in for the visitors. Now the complexion of the game game was changing in favour of Wodson Park as the had a goal disallowed for offside from Ciaran Donegan. Then minutes later the ball was in the back of the Winslow net once again but another offside, this time the hosts failing to deal with a ball in. The yellow and blues were riding their luck midway through the first half. Credit to Winslow they finished the half strongly with a plethora of chances. The first key chance coming from Grant Karwacinski who blazed over from a Simon King cross. The second one was the best opportunity to get back on level terms as the two brothers Simon and Aaron King were bearing down on goal as Simon passed to Aaron who slotted home only to be cancelled out for offside. The half time whistle sounded as Wodson Park went in the dressing room the happier of the two teams 1-0 up but Paul Alleyne’s men more or less dominated while the visitors were making the breakthrough hard to come by for the hosts. A very good early start to the second half from David Stingemore’s players with Halls getting in behind the backline and shot with a unconvincing save from Ashmead but Karwacinski cleared any danger that was present. From the resulting corner Ciaran Donegan found himself free six yards out from goal as he volleyed in to make it 2-0 to the visiting outfit. Tempers were really flaring for both teams now because the flow of the game kept being halted by the referee. Those tempers ultimately boiled over for Halls as he was shown yellow for his second bookable offence for kicking out. Still both teams were not creating many clear-cut chances since Wodson doubled their lead. Simon King had a free kick in a dangerous position but was equalled by a good low save from Wells who was looking unbeatable. Another home team chance came with Aston Goss floating in towards Karwacinski, who could only manage to head over the bar. The chances kept coming for Winslow as Simon King once again tried his luck from long range but this time the shot clipped the top of the net and out for a goal kick. Winslow were once again having another spell of dominance but Wodson Park were having none of it as the would not allow the ball to go into their net. The game was all yellow and blue now and they could of halved the deficit but the referee called a free kick instead of a penalty with what was a really close call. From the resulting free kick Aston Goss curled viciously towards the back stick but produced another fine save by Wells. This time Kedzierski played a beautiful ball through to Aaron King who could only fire over the bar but to his credit the recovering defender did just about enough to put him off. On the counter attack the visitors could of put the game to bed as George Lyons was through on goal but could only managed to hit the post. A lucky escape for Winslow but Wodson had counter attacked brilliantly throughout the whole game. Back down the Winslow end where Aaron King laid off Simon King but once again another great save by Wells who was having the game of his life. Finally the hosts pressure paid off through a free kick smashed into the wall by Simon King with the ball falling to Aaron King who made it 2-1. It was a nervous last couple of minutes for Wodson Park but they ultimately held on to complete a 2-1 win. Winslow had spells of dominance throughout the whole game and created a plentiful of chances but it was not to be for the high flyers today. However the resilience shown by David Stingemore’s men will be something he can be proud of as they took three points back to Hertfordshire. Winslow United maintained their push for second place in the Spartan South Midlands Football League Division One table, but for an hour or so looked like they were going to rue a hatful of missed chances; behind to a rare Ampthill attack moments before the break when Jamie Cerminara swivelled to fire home they then started the second half against a rejuvenated Town side who, following a first half where they had defended for their lives, started on the front foot. However, once United won a penalty after Aaron King was felled inside the box, Ryan Freshwater levelled the game and from that point the home side dominated but left it late before scoring twice more, the third being controversial which caused such debate amongst the Ants back line and the referee that full back Glenn Cooksley was shown two yellow card in quick succession leaving his side to face the final few minutes down to ten men, but on the balance of play both managers agreed that the hosts had fully deserved the three points. Ampthill were first to threaten when a ball downfield for Cerminara to chase after had Winslow keeper Sam Ashmead having to advance from his area to head away, but on four minutes the home side had their visitor’s defence throwing themselves in front of a succession of shots when Aaron King got ahead of his marker only for Town custodian Josh Thompson to come sliding out at his feet, from the acutest of angles King managed to recover and aim for goal which saw Cooksley sliding in to block on the line but his clearance only found King again whose second attempt found the defender still on the post to clear again, despite the best efforts of Dan Parsons & Sean Coles trying to keep the ball in play the away side somehow got it out to safety. A cross from the Winslow right found the head of Coles in the middle however he could only loop the ball up in the air where Thompson had to follow its flight until it landed safely on top of the netting, Aaron King then played a one-two with Parsons being aiming for the back post but his effort was never on target. Moments later a corner to the home side curled in saw Thompson come out to punch but the ball eluded his outstretched arm to find Aaron King at the back post but at full stretch he could only help the ball out wide, ahead of a ball played through the middle of the Town backline which saw Parsons in on goal, rounding Thompson who dived at his feet he advanced a yard too far which allowed the keeper to stick out a hand and push out for a corner. An early Winslow cross after the break found Kieron Schmidt at the near post but he could only screw wide, Parsons attacked down the channel before driving across goal and wide of the upright, and Aaron King saw a shot from the edge of the box comfortably saved by Thompson. King was then fed again twenty yards from goal, holding the ball up well he turned his marker before shooting straight into the gloves of the Town keeper, then on sixty-seven minutes the hosts won a penalty. Aaron King was away down the left and as he powered into the area Ash Mead came across and slid in to challenge; the United striker going over the defenders outstretched leg and with a clear view behind the referee pointed immediately to the spot, Freshwater tucking home to level matters. The home side were now ruthless with their attacks and Parsons got down the left but his cross lifted over the crossbar before Simon King drove forward from midfield before unleashing a stinging drive that flew inches wide of the Town keeper’s right hand post. As time ticked away any hopes the Town side had of holding on for a point were dashed with six minutes remaining, a cross from the right by substitute Shiblu Miah eluded the Ampthill defence and keeper & at the back post fellow sub Luke Desmond side footed into the unguarded net. Desmond then did really well working hard down the left wing, battling it out shoulder to shoulder with his marker but getting the better of him to get to the byline and pull back across the eighteen yard box to Simon King who fired straight at Thompson, then with a minute to go the home side put the game to bed with some controversy.